The Campbell Hausfeld air line inflator gauge (MP514200AV) features a dual-foot air chuck for use in hard-to-reach areas and a 10 - 20 PSI gauge, calibrated in 2 PSI increments. The built-in relief valve can be used to reduce pressure in overinflated tires and to zero the gauge. Includes a 12-inch flexible hose. 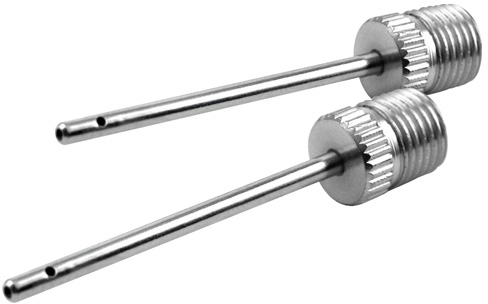 Thread size: 1/4-inch NPT (F). Air and Light at Your Fingertips: A small unit at less than 8x7x3 (inches), it takes up almost no space yet delivers up to 150psi at 15L a minute! 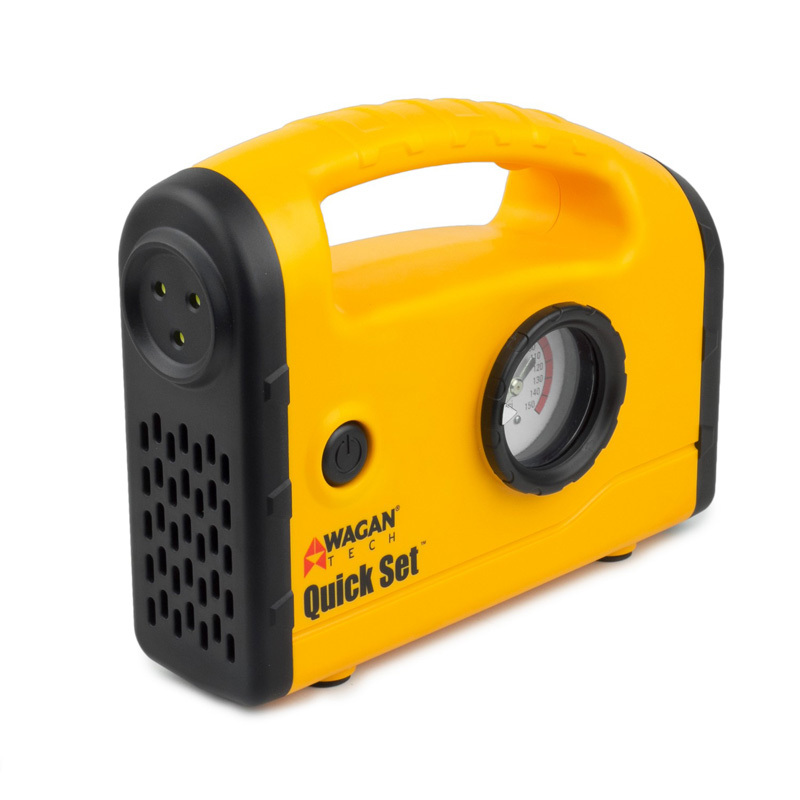 The 12V Quick Set Inflator Compressor can handle nearly any tire from passenger car to light trucks and SUVs. A built in 3-SMT LED light helps to illuminate the roadside at night and keep you and your work-space visible. The Compact size of the 12V Quick Set Inflator Compressor allows you to keep one almost anywhere; in the trunk, glove box, center console, the 12V Quick Set Inflator Compressor is ready to go when you need it. Don't subject your loved ones to airing up their tires at a gas station, or leave them vulnerable on the roadside at night waiting for help. The 12V Quick Set Inflator Compressor will allow them to service their own tires at a safe location of their choosing. 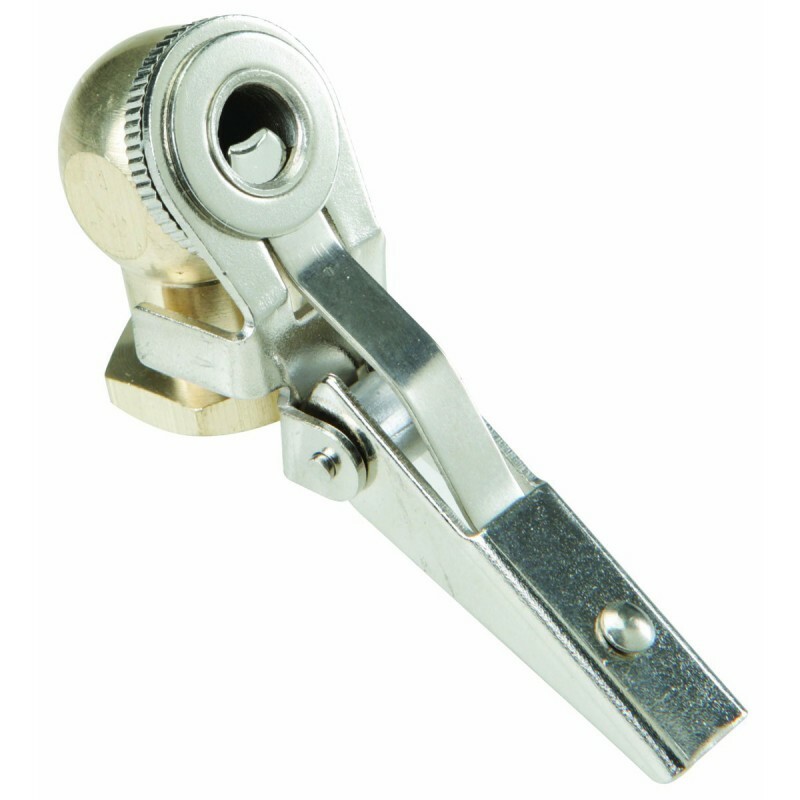 The Campbell Hausfeld dual-foot air chuck (MP323100AV) is an extended air chuck for hard-to-reach valves on trucks, tractors, buses and other large equipment. The angled head on this dual-foot air chuck can inflate on either side. A built-in shut-off valve seals air when not in use. 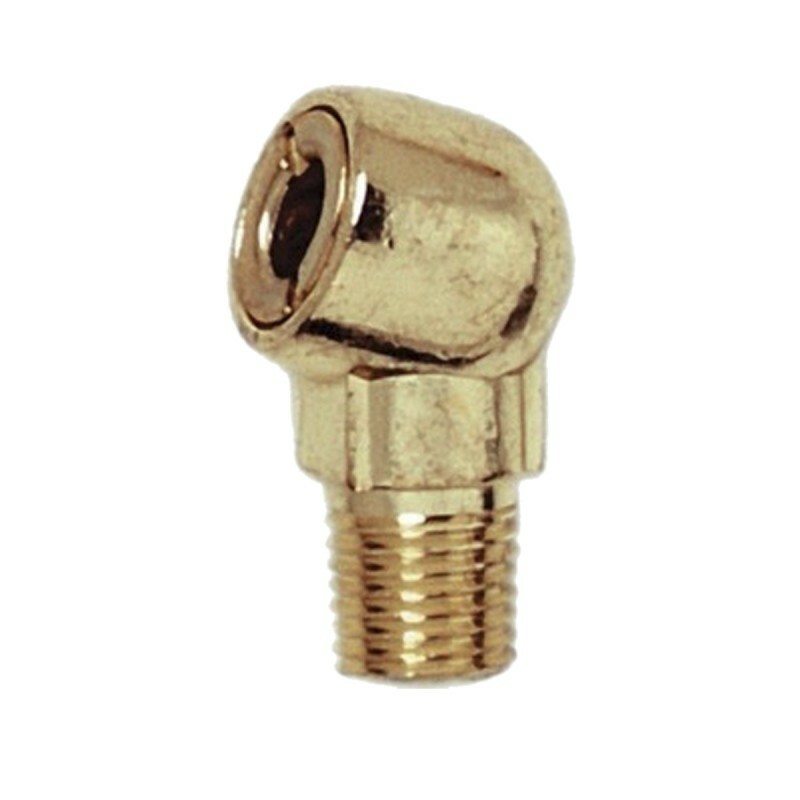 1/4-inch NPT (F) thread size. The Campbell Hausfeld tire chuck with clip (MP323200AV) has a unique clipping system that generates an air-tight seal around a Schrader®-style tire stem, making it easy to quickly inflate tires without leaks. 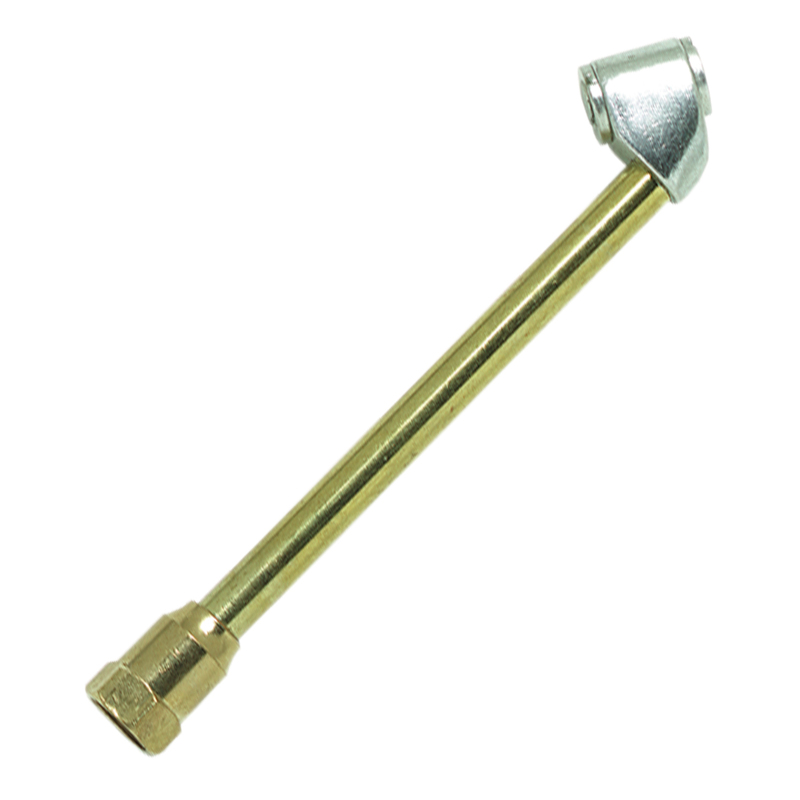 Use PTFE thread-sealing tape (MP513600AV) to screw the tire chuck clip directly onto any air hose with a 1/4-inch male NPT end. Does not fit Presta- or Woods-style tire stems (found on some bicycle tubes). Note: Schrader is a registered trademark of Schrader-Bridgeport International, Inc. Campbell Hausfeld and its products are not affiliated with or endorsed by Schrader-Bridgeport International, Inc. The Campbell Hausfeld 1/4-inch NPT (M) ball foot chuck (MP212000AV) is designed to inflate car and bike tires. 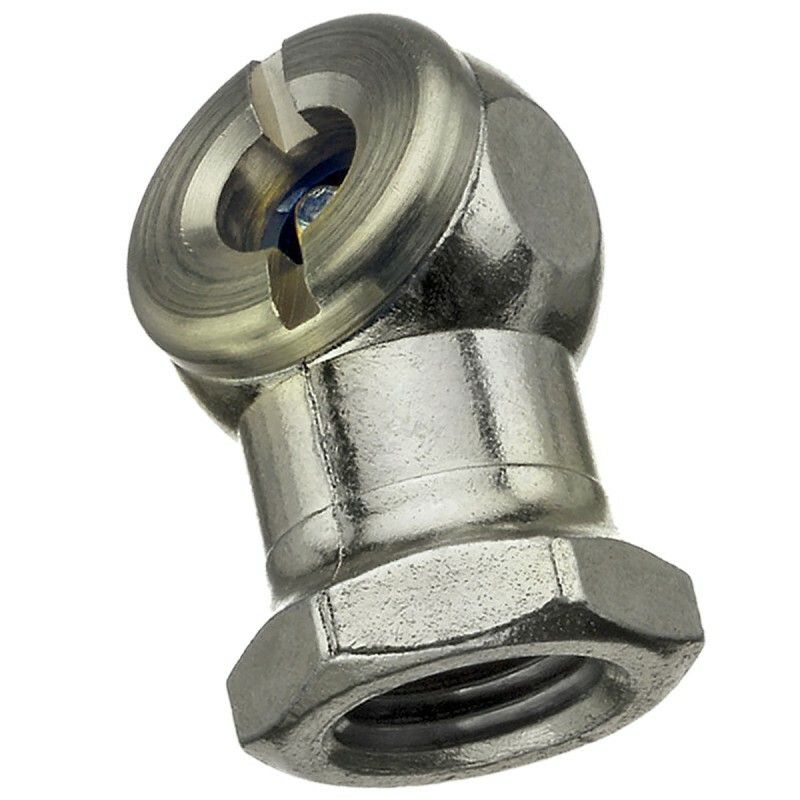 A built-in shut-off valve stops airflow when not in use. Note: Not for use with inflator gauges. The Campbell Hausfeld pencil tire gauge (PA112500AV) can be used to measure the air pressure in tires on road bikes, trucks and many other vehicles. 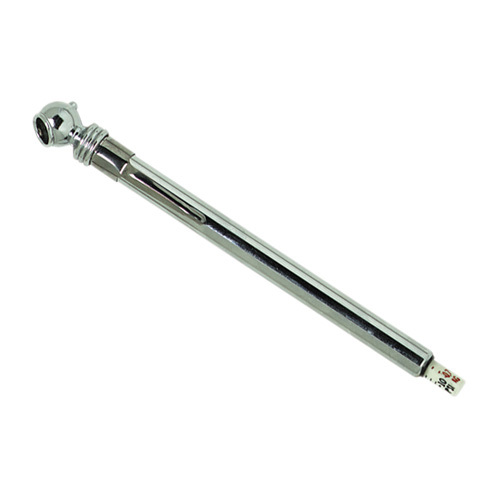 Calibrated from 10 - 120 PSI in 2 PSI increments on two sides, this tire pressure gauge is ideal for performing regular tire pressure checks, which can help prevent blowouts and prolong tire life. 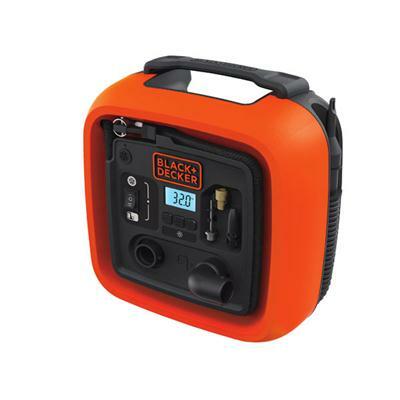 The BLACK+DECKER 12V DC multi-purpose inflator can handle many inflation tasks. Its high-volume output quickly fills large inflatables like rafts and air mattresses while the deflate function rapidly empties the air for quick cleaning up. 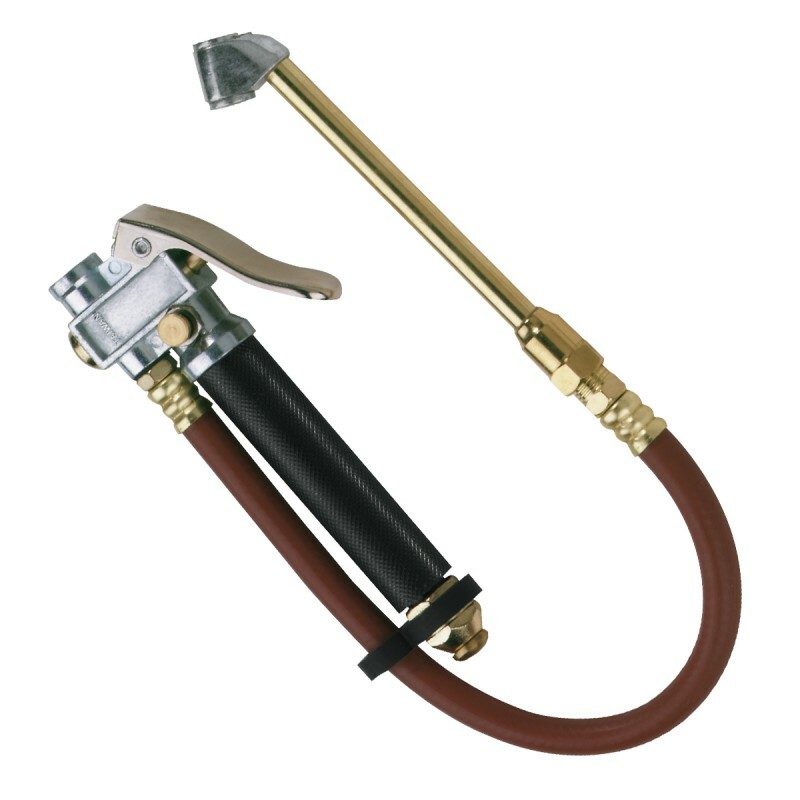 The high-pressure output works to inflate tires or sport balls. With a digital pressure gauge and automatic shutoff technology this inflator gives set-it and forget-it peace of mind. This item cannot be shipped to APO/FPO addresses. Please accept our apologies. 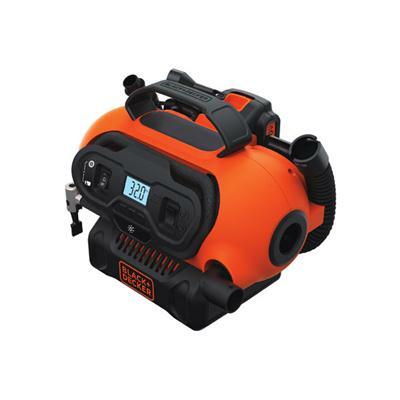 The BLACK+DECKER 20V MAX Lithium Ion multi-purpose inflator handles inflation needs anywhere. The three power sources allow for inflation inside the home on the road or in the backyard. 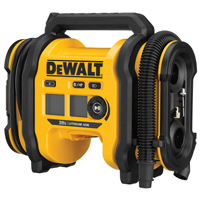 Its high-volume output quickly fills larger inflatables like rafts and air mattresses. Plus the deflate function rapidly empties the air for quick clean up. The high-pressure output inflates tires and sport balls. Complete with a digital pressure gauge and automatic shutoff technology this inflator brings set-it and forget-it peace of mind. This item cannot be shipped to APO/FPO addresses. Please accept our apologies. 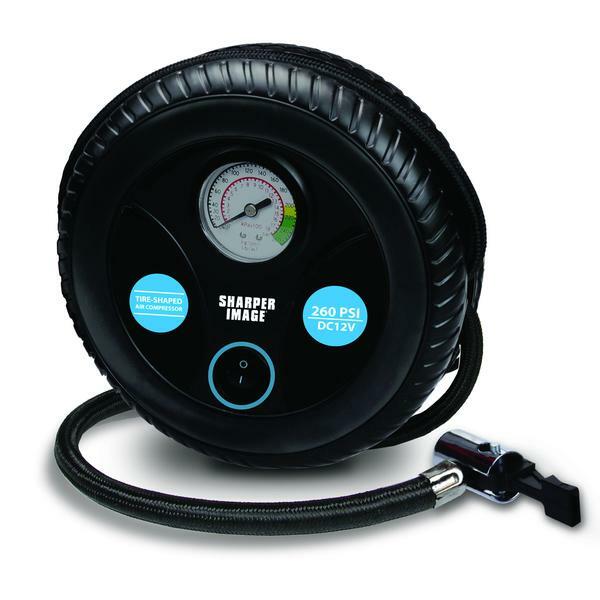 SHARPER IMAGE TIRE INFLATOR� CRSIAA8 The Sharper Image Tire Shaped Air Compressor�is a necessity�in�every car! 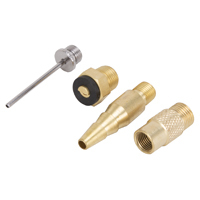 260 PSI Air Compressor Includes Nozzle Adapter Set The adapter�plugs into any�vehicles lighter slot. The Campbell Hausfeld pencil tire gauge (PA112400AV) can be used to measure tire pressure on passenger cars, vans, light trucks and many other vehicles. 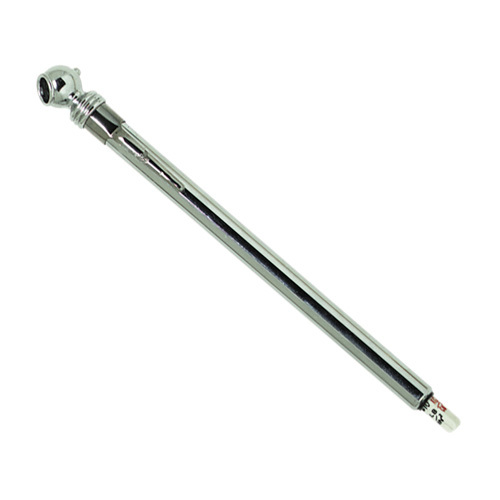 Calibrated from 10 - 50 PSI in 1 PSI increments on two sides, this tire pressure gauge is ideal for keeping in your vehicle to perform regular tire pressure checks, which can help prevent blowouts, prolong tire life and improve handling. 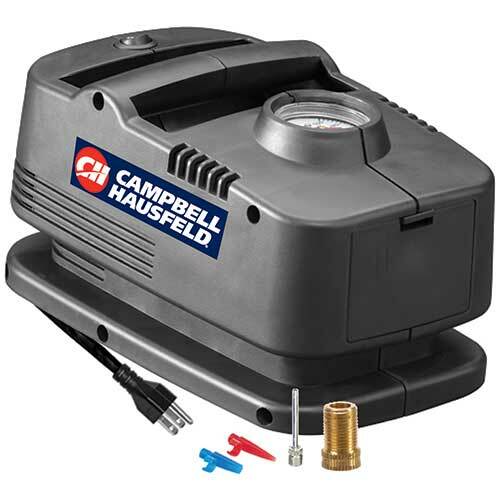 The Campbell Hausfeld cordless inflator (CC241001AV) delivers up to 140 psi and also serves as a portable, rechargeable 12-volt power supply. Use this inflator on most bicycle, automotive and recreational tires, as well as air mattresses, rafts, sports equipment and more. A built-in pressure gauge simplifies monitoring air pressure levels during operation. Its convenient, built-in power supply can operate or charge many 12-volt devices, helping to keep your essential electronics up and running wherever you go. 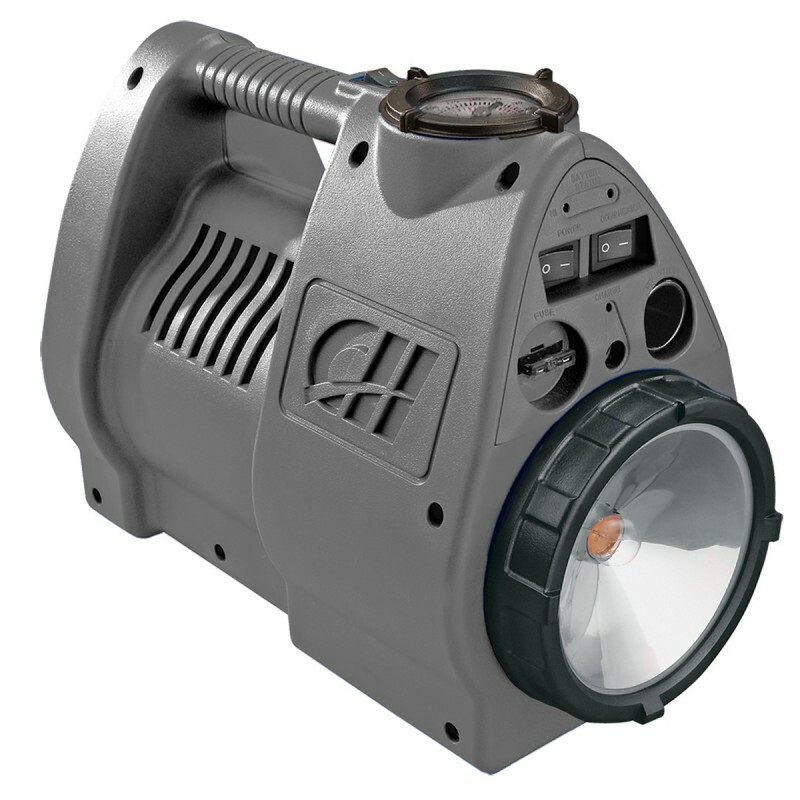 An integrated work light provides bright illumination for easier use in dark places or at night. Includes two inflator nozzles and one sports ball needle. Usage: Inflates Tires, rafts and sports equipment. Power cord length (ft.): 10 ft.